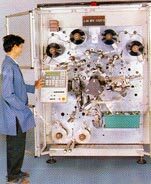 TIBREWALA ELECTRONICS LIMITED, incorporated in 1985, is one of the largest manufacturers of AC. 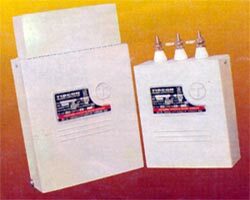 Capacitors in India. TIBCON Capacitors are manufactured using metallized polypropylene film at the company's modern air-conditioned facilities in Hyderabad. 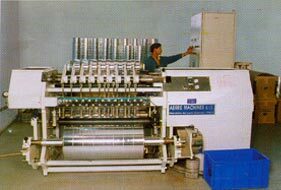 The capacitors are wound on fully automatic, state of art winding machines. TIBCON Capacitors employ environment friendly non-PCB encapsulate. TIBCON Capacitors are extensively used by OEM's in electric fans, motors, pumps, air conditioners, refrigerators, air coolers and lighting fixtures. Of all the ceiling fans manufactured in the country, a majority of them incorporate TIBCON Capacitors. TIBCON manufactures MPP Film for capacitors which is made on Leybold High Vacuum Roll-Coating Plants (Germany) in a technical tie-up with ICAR s.p.a., Italy. The Quality system conforms to ISO 9002. TIBCON Capacitors incorporate MPP Film made out of bilayer metallization in which heavy edge of zinc is formed to provide better bonding between the electrode and the end spray. Heavy edge has high current carrying capacity and ensures better withstand of the electro-mechanical stresses caused by switching surges. TIBCON Capacitors have excellent self healing property whereby any electrical short circuit inside the element is cleared in milliseconds without affecting the normal operation of the capacitor. The low dissipation factor associated with the MPP Film keeps the losses low and extends the useful life of the capacitor. TIBCON Capacitors range form 1 MFD to 144 MFD with voltage rating of 250/440 VAC and Frequency 50 Hz. TIBCON Capacitors are type tested at accredited laboratories Viz, National Test House, Kolkata, ERDA. Vadodara and, CPRI, Bangalore. Certificates of type testing are made available on request. IS 2834/1986, BIS Certification marked, rating 1.0 KVAR to 30.0 KVAR in single unit. TIBCON Power Capacitors are offered in Compact types upto 8 KV AR and for higher rating in modular types; Heavy duty types, are available for application in Re-rolling mills, Steel plants, Welding and Fabrication shops. 2 KVAR capacitors are also offered in Cylindrical construction. TIBCON Capacitors are guaranteed against manufacturing defects for a period of 12 months. The Dimension of the capacitors given in the above tables are liable to change. 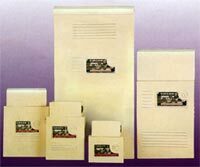 The capacitors can also be offered to meet any other specific requirements of the customers. The fan, lamp and motor capacitors are available with tag or cable termination in plastic or Aluminium Housing. * The Length includes 35 mm extension as provision for fixing the capacitor. ¤ Reduced power costs due to reduction in KV A demand. ¤ Prevention of low power factor penalties. Release of system capacity due to reduction in total current drawn from the mains. ¤ Reduction in power losses, increase in efficiency of the system and life of electrical transmission equipment. ¤ Reduction in voltage drop, improving voltage regulation. ¤ Reduction in size of cables, transformers and switchgear with consequent lowering in capital costs. ¤ Cost of capacitor is recovered in a short period. ¤ 100% depreciation can be claimed in the first year, under Income Tax Act. TIBCON MPP Heavy Duty Capacitors are specially designed to meet demands of heavy duty industrial loads such as forging shops, rolling mills, rectifiers etc. TIBCON Heavy Duty Capacitors are built with the correct degree of protection, to withstand higher over current and higher surge voltages. TIBCON Power capacitors are manufactured with Aluminium - Zinc or Silver - Aluminium Zinc metallised, heavy edge M.P.P. Film which ensures better bonding between the electrode layer and the end spray. Heavy edge has high current carrying capacity and ensures better withstand of the electro-mechanical stresses caused by the switching surges. The Power Capacitors have excellent selfhealing property whereby any electrical short circuit inside the element is cleared in milliseconds without affecting the normal operation of the capacitor. The low energy consumption keeps the internal operating temperature low, extends the useful life of the Power capacitor and reduces operating costs. low dissipation of MPP Film combined with the superior thermal conduction property of the encapsulate permits operation under high temperature condition. TIBCON Power Capacitors are available in modular construction. This construction enables easy and inexpensive repair at site and also saves on spares inventory cost. TIBCON Power capacitors are provided with inductor coils to control the inrush current to the capacitors. This feature ensures long term stability of KV AR output and extends their life. TIBCON Power Capacitors are designed for compactness and efficient cooling. Thus, capacitors ranging upto 8 KV AR are compact in size and the higher rating capacitor units are provided with ventilation. 1. Range : 1 KV AR to 25 KV AR In single units. 2. Power output Tolerance : For higher output, banking facility is provided. 5. No. of Phases Connected :Single Phase or Three Phase with or without internal Delta Connection. TIBCON Power capacitors are guaranteed against manufacturing defects for a period of 12 months from the date of installation or 1 8 months from the date of purchase, whichever is earlier. Power Capacitor (KV AR) = Connected load (KW) X Multiplying Factor = 74.6 X 0.291 = 21.70. Power Capacitor of 20 KVAR should be selected. The recommended Capacitor ratings, shown in the table, are for improving the power factor to 0.95, and these values are for guidance only.